Many modern ham radios operate on low voltage DC instead of high voltage AC. This is done for several reasons. First, most of the circuits inside these radios actually run on low voltage DC, so high voltage AC isn’t needed. Second, running the radio on low voltage DC saves space inside the radio. This is because the radio can directly accept the low voltage DC it needs, and dosen’t need an internal power supply to convert from high voltage AC to low voltage DC. Finally, the last advantage is that these radios can easily be installed in a car or run on a car battery. Many DC power supplies on the market today provide 12 Volts DC (Actually 13.8 Volts is considered “nominal”). It is important to check the specifications and make sure that the output voltage on the supply is close to what your new radio calls for. A few volts difference is usually OK.
Next, check the maximum continuous current rating of the power supply. 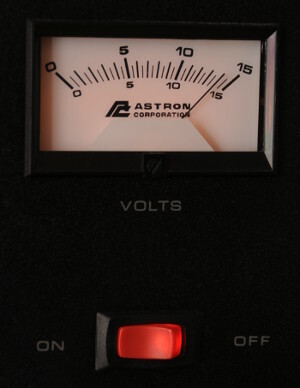 The power supply should provide at least the amount of current your radio needs plus 10%. The extra 10% is headroom to prevent your power supply from overheating. Most hams follow this extra 10% rule and some go even higher. Remember that you radio will not always need the max current that is listed on the radio’s specs. This is usually the current drawn when the radio is transmitting on full power. The current the radio requires when it’s receiving is typically much less. So, in conclusion, you will need a power supply that matches the voltage of your radio, and can supply enough current to keep your radio running. Extra features like meters aren’t absolutely necessary, but can be nice for troubleshooting problems, however, they cost more!